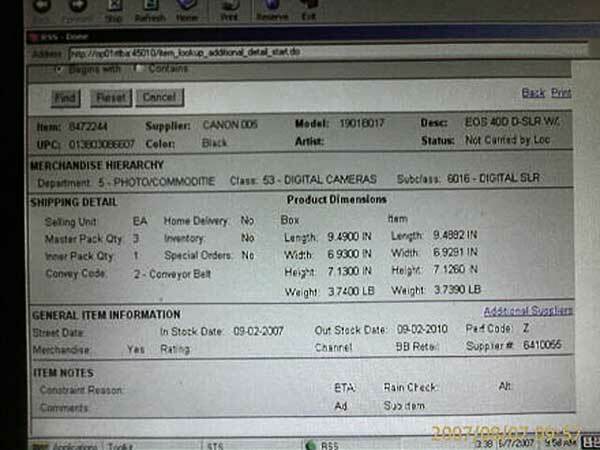 2007 August 18th In a detailed email we received about Canon product plans, it seems that a 40D was indeed ready back in February/March, but got pulled because it just didn’t stand out enough in the market. Canon were surprised at just how well the D40/D40x and D80 did, so have taken a real ‘throw everything at it’ approach to the forthcoming 40D. Some of today’s crop of rumours point to the previous 40D photos from last week being fakes. Well -if- that does turn out to be the case, then I take my hat off to whoever did them. By far the most convincing looking ones I’ve seen in several years of rumour monitoring. Follow the rest of the thread for more discussions about this – I’d be curious as to why a listing would pick ‘Digic III’ and a 2.5″ LCD as features to mention. However, don’t go looking for 45 point AF – look at the viewfinder shot from the 3rd – 9 AF points. Just a reminder – the 30D specs are listed at the bottom of this page if you want to make comparisons. Also, no weather sealing. 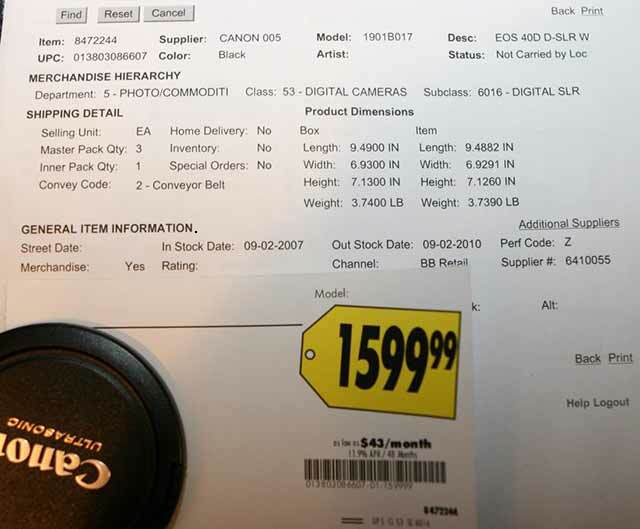 16th As a follow up to the ‘Best Buy’ stories a few days ago – several people are posting on forums that they’ve gone into their local stores (in the US) and confirmed that a 40D is in the BB stock system at $1599 and is due on the second of September. Some people are still hoping for full frame, but if those product shots from last week are genuine, then note that it’s an EFS lens, so no FF. 12th 14bit raw? A set of specs at this Spanish site suggests that 14 bit processing and DR are coming to the 40D. 11th It seems (thanks) that a Best Buy in New York also has the 40D and 28-135 lens listed for $1599… arriving September the 2nd. 9th The rumour pendulum swings the other way? –Thanks very much for that! 8th An all new version of the picture appears on EG – an actual BB screen shot?? … this is an enlarged version of the one posted. More on the pic below… I see it’s in a UPC (barcode) database, but note that the database entry was only made last night and has a pending update. 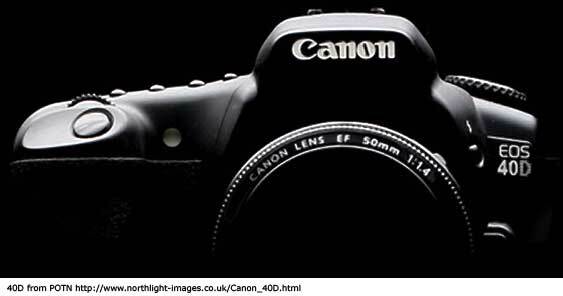 Over at FM there is a report of a major (US) electronics company starting to carry the 40D on the 2nd of September. flash synchronization at 1/250 sec. New Lens kit Canon 18-55 f3,5-5,6 IS. 4th Weather sealing for the 40D? Long a feature discussed by people concocting spec lists, some form of enviromental sealing is available of some competing products. Look at these enlargements from yesterday’s pictures. The ring anound the buttons is typical of how Canon weather seals existing bodies. 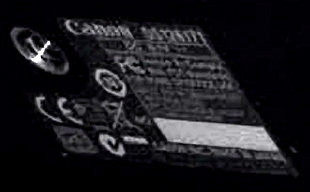 The second view shows the new flash shoe design. The MK3 shoe has additional protection and mates up with the 580EX II flash to give a better seal. July 28th I’m told the advert referred to on the 26th is on page 39 of AP (anyone got the magazine and want to send me a quick scan of the advert?) and that the French article also suggests 14 bit processing rather than 12 bit (this from RZ). That would suggest that Canon have got sensor noise from small pixels down quite a bit. 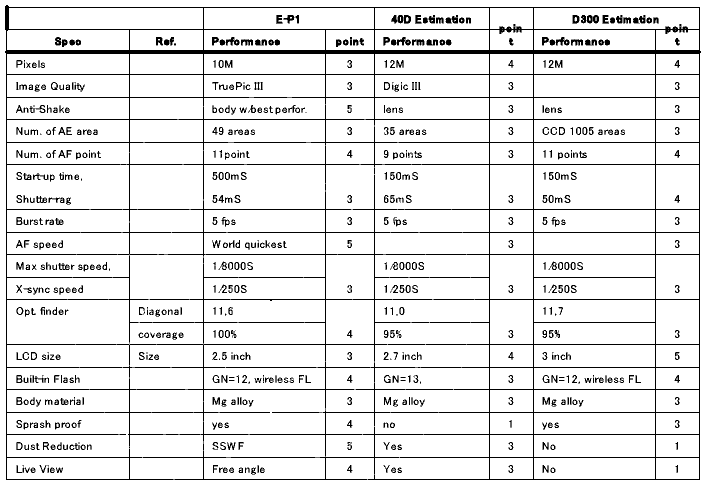 Certainly useful if they want to get 22-23MP on a full frame sensor for a 1Ds3. Improved AF – based on 5D?. 18th Over on EG there is a mention of the 40D appearing in a CIPA (Camera Imaging Products Association) PictBridge certification list. Sensor 1,6x de 10 Mpx. anti dust sensor. LCD de 3 inch. LiveView. JPG, RAW , new sRAW. ISO 100 a 1600 en pasos de 1/3. 6,25 fps, 75 JPG o 17 RAW. A 10MP sensor might signal a lull in the MP race and a concentration on image quality. 6th I heard reports that the Olympus file was not available any more – I just checked and the link still works. >> For entertainment and amusement value only! Not to be taken too seriously! Is the 30D on its way out? This from B&H in the US. 27th While only the 400D rebates are directly listed as running on, there are ‘instant rebates’ in the US on various lenses until July 16th. Meanwhile on EosNumerique (note yellow banner text [in French]) there is talk that the 30D replacement is coming in July – possibly the week starting Monday 16th? Also, on FM there is a post from someone in France saying a dealer has told them that the 40D is to be announced in July (same source??). 21st I’m told that the 400D rebate(Canon info) has now been extended until the end of August. The others are still set to run until the end of June (or July in Australia). June 1st Quite a few 40D related rumours circulating, but nothing really new (i.e not already mentioned below). The cashback offers are still running strong, and I don’t believe Canon usually announces replacements while there are still offers on the old kit? Meanwhile, what about those mock-up Sony SLRs at PMA? (9th March on the Main 1Ds3 page) Could one be FF? See this thread on DPR where June/July is mentioned although this post suggests that the A300 is for this year. 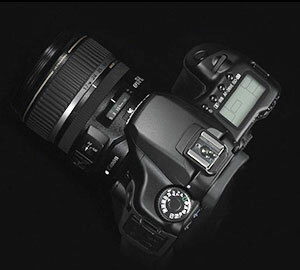 April 28th There’s a dealer rumour on FM from France suggesting that the 40D will arrive in July and will support EF-S lenses – however the same source says no 5D replacement this year. 14th From Germany (thanks), a usually reliable German computer magazine called c´t mentioned that the 30D successor will be announced in May. There’s been no meaningful (or even interesting) 40D related info for a while now, and with the cashback offers running till July, I’m not expecting anything until Aug/Sept at the earliest. 12th PMA is over and there are now various 30D deals appearing around the world. The ’20th Anniversary’ kits and offers in the scanned PDF I mentioned the other day are now appearing. I had a report of them on the Warehouse Express web site here in the UK (as ever check actual prices on their websites since prices/kit contents have been moving quite a bit). I don’t think anyone realistically expects a 40D from Canon any time soon – those 30D offers run until June. 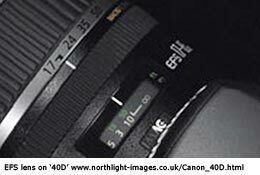 There’s plenty of debate about the lack of 40D on the forums (such as this DPR thread). I get quite a few mails from visitors (thanks – it’s appreciated) asking about various issues I’ve noted, and pointing me to new information. 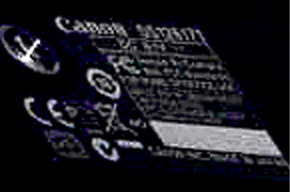 One question that has popped up regularly is “Does Canon listen?” – well like any big corporation, their marketing people do listen to what’s going on, but I’ve seen far too many posts on forums that fail to make the distinction between “What Canon -could- produce” and “What Canon wants to sell as part of its overall product range and overall product strategy” – big difference. February 27th Further on from the ’30D discontinued’ thread, there are two possible reasons for the 40D ‘No Show’ given. This camera has an awful lot of new features – good pointers to what might trickle down to the 40D when it arrives. Over at DPR we get told that there will be no 40D at PMA. The 30D has only been round for a year or so, so maybe in September? Well, at least you can now get a 1/6 scale miniature model of the 30D. Note that this may just be ‘guestimate specs’ as a placeholder for the real info – if and when it turns up. 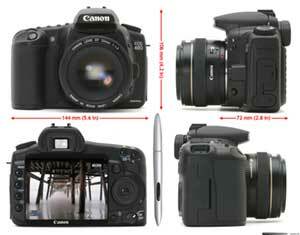 An 10.1 Megapixel CMOS sensor provides the sensitivity needed for clean, detailed images with fine colour gradation. Large sensor pixels allow for wide dynamic range and reduced noise at higher ISO speeds. The 22.5 x 15mm sensor size adds an effective 1.6x increase to the focal length of EF lenses, extending reach at the telephoto end. Illuminated by 6 LEDs, the bright 2.5 Inch 230K pixel LCD is viewable from 85° in almost all directions. The EOS 40D is compatible with over 60 EF lenses (including the EF-S Series) and all EX Series Speedlite flash units. 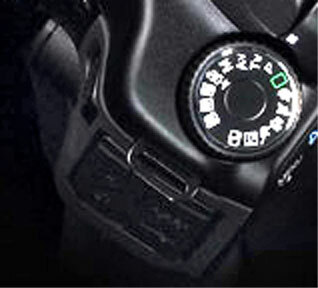 The E-TTL II flash algorithm passes key shooting data from compatible EF lenses – such as focal length, point of focus and distance information – to the Speedlites for consistently accurate flash exposures. Untethered shooting is possible with the optional Wireless File Transmitter WFT-E1. 13th Many people are going to be rather amazed if we don’t get a 30D replacement soon. 23rd In a neat move, the Hong Kong Canon 40D page from yesterday now points to 400D information. An update seemed worthwhile since there has been a lot of renewed speculation about this possible camera, although I’ve yet to see any real clues! “Please know that this camera is not scheduled for a release anytime soon that we know of, or if it even being developed at this time. 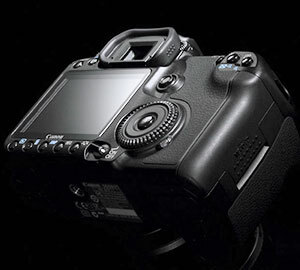 The EOS 30D is still current, and will remain so for a while. I am sorry to say that your writer may have been misinformed. Unfortunately our hosting service just had a major outage overnight so this site was down for a bit. We must thank the person who suggested that this was in some way due to incurring the wrath of Canon :-) :-) gave us a good laugh while we were wondering what had happened to our sites and email! An 8.2 Megapixel CMOS sensor provides the sensitivity needed for clean, detailed images with fine colour gradation. Large sensor pixels allow for wide dynamic range and reduced noise at higher ISO speeds. The 22.5 x 15mm sensor size adds an effective 1.6x increase to the focal length of EF lenses, extending reach at the telephoto end.